The Utah Royals beat Sky Blue FC 2-1in a Saturday night showdown before the international break. SCORE: 0-1, min. 3, Matheson. 1-1, min. 9, Groom. 1-2, min. 85, Freeman (OG). 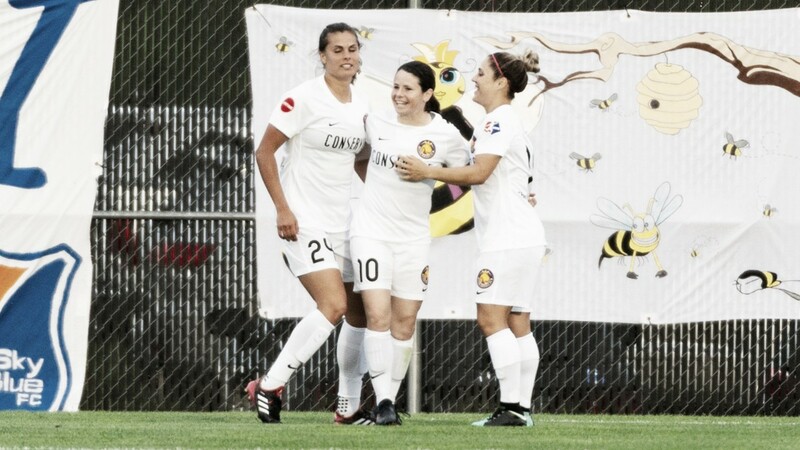 The Utah Royals earned their first-ever road win in a 2-1 victory over the bottom-of-the-table Sky Blue FC. The Royals move to 3-2-5 on the season with 14 points and sit in sixth place but are one point back of third through fifth place and two points back of second. Sky Blue, however, is nine games in and still winless with a 0-8-1 record. Shea Groom scored for the home side Diana Matheson and an own goal were responsible for the other two. Neither side was at full strength due to injuries and absences. For Utah, Amy Rodriguez, Becky Sauerbrunn and starting goalkeeper Abby Smith were all gone due to international duty. Kelley O’Hara missed another game due to a hamstring injury. In place of Smith, veteran goalkeeper Nicole Barnhart was in net and recorded two saves, only allowing the lone goal in the first half. Katie Stengel and Sydney Miramontez both shifted into the starting line-up to replace the absent players. Sky Blue was down Carli Lloyd and rookie Savannah McCaskill for the match and suffered an early setback when Amanda Frisbee went down with an injury in the 31st minute forcing the home team to make an early substitution. All three goals came during the run of play. In the third minute, a turn over to Gunny Jonsdottir in the midfield led to the Icelandic-internation to dribble up the left side and cross the ball into the box where Matheson slid into it and put it in the back of the net. The goal is Matheson’s second of the season making her the leading goal-scorer for Utah. She is not the leading scorer for two different teams, the other being the Washington Spirit where she had 23 goals during her time. Sky Blue was able to level up the match a few minutes later in the ninth minute. Frisbee sent the ball up to Katie Johnson on the left flank who cut it into back to Groom who put it in for her first goal of the season and first goal with Sky Blue. Both sides would contue attacking and the match looked like it would end in a draw, but the own goal in the 85th minute put the Royals up for good. Jonsdottir got the ball and dribbled up the right flank. She crossed the ball in, intending it for Stengel, but Sky Blue defender Mandy Freeman slid to try and clear it, but instead put it in the back of her own net to give Utah the 2-1 lead and the win. Both teams will return to action after the conclusion of the international break. Both teams will play on the road on Saturday June 16 with Utah kicking off at the North Carolina Courage at 7:00 p.m. 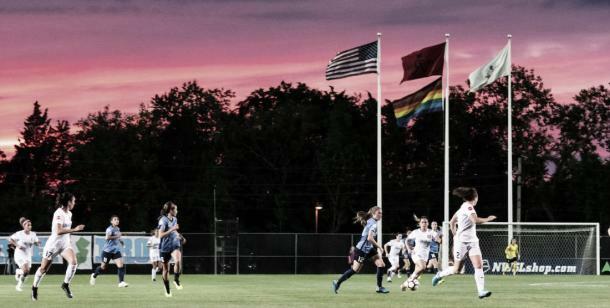 ET and Sky Blue kicking off at the Orlando Pride at 7:30 p.m. ET. Both matches will stream live on go90.com and the go90 app which is available for download on iOS and Android devices.